Then (left): The Investment Building ca. 1925. Now (right): The same location today. 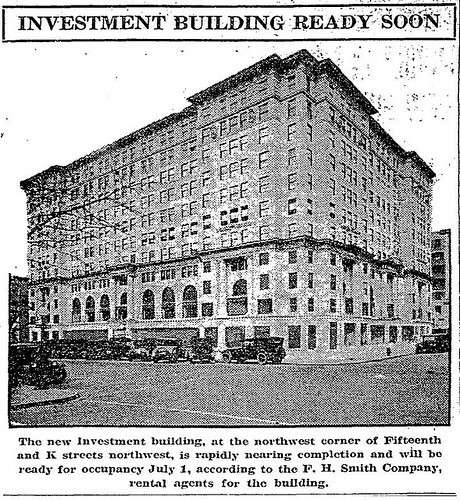 The Investment Building was scheduled for occupancy on July 1, 1924. 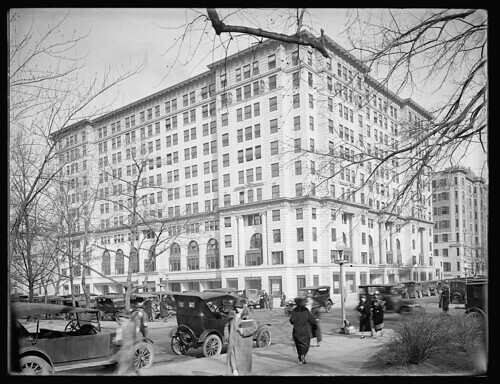 Situated on the northwest corner of 15th and K Streets, NW, the building was designed by Washington’s premiere Beaux-Arts architect, Jules Henri de Sibour. According to the Washington Post of the time, it was considered to be in the Italian renaissance style with the entire frontage finished in limestone. The facades were broken up with fluted ionic columns, the bays emphasized by spiral cut stone and rusticated quoins. Many novel and interesting features were included in the Investment Building, chief among them the provision for parking in the basement. 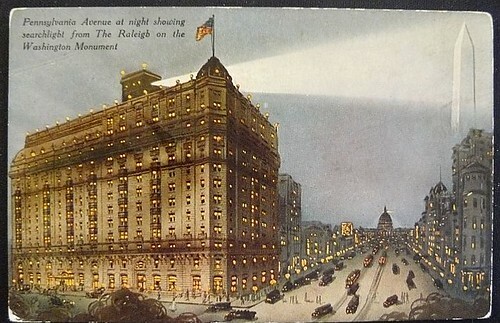 The Post claimed the building was the first office structure in the East to adopt this feature with parking for 200 automobiles. Other modern conveniences included six high-speed elevators, with express service for the upper floors of the eleven story building. There was also a separate freight elevator. A public information bureau was also installed in the main lobby which furnished data regarding trains, theaters, hotels, current events, etc., to the general public. This was unique to the Investment building in 1924. Fast forwarding to 1999, with the exception of the southern and eastern facades, the entire building was razed and replaced by Cesar Pelli. The new Investment Building opened in the fall of 2000. Some consider the new interior space among the best in the city. The upper floors are currently occupied by Sidley Austin LLP. The Stoneleigh Court Apartments were built in 1905 as a monument to John Hay’s love of the French style. 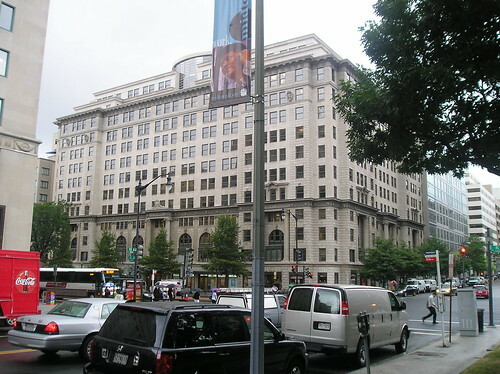 It was located strategically at the southeast corner of Connecticut Avenue and L Street. It was once one of the most fashionable hotel residences in the city, numbering among its residents Supreme Court Justice Louis D. Brandeis. Stoneliegh Court cost $1 million when built — 28 cents per square foot then — and its interior was the plushest in Washington. The halls were of marble, trimmed with oil-finished birch and oak. 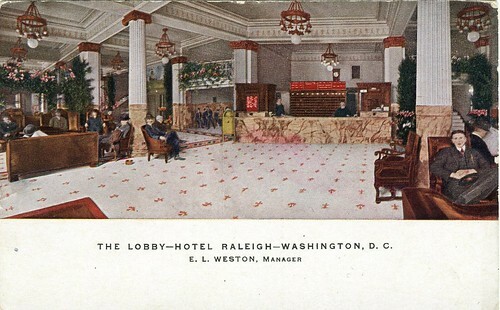 The floors were of oak and Alabama pine, and the lobby was finished in marble mosaic. The exterior sported elaborate cornices, and the heating system was considered the latest in comfort. This was the specific design of its owner, John Hay, Secretary of State under Presidents William McKinley and Theodore Roosevelt. By 1953, the apartment’s street front level housed ten stores and offices. Flashy new buildings grew up around it and Stoneleigh Court slowly became a place of the past. By August 1965 it was being assaulted by the blows of the wrecker’s ball. 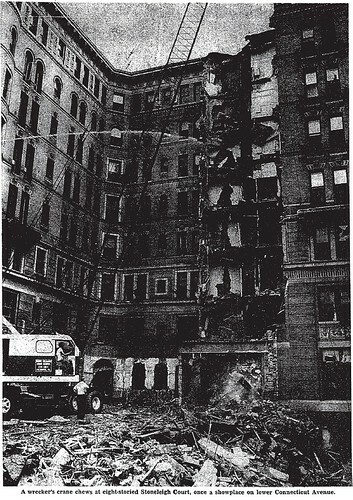 Demolition of the luxurious eight-story building being deemed necessary to make way for another of the window-sheet office buildings that had begun to populate Connecticut Avenue.